Lecip Corp., a Japanese electrical equipment manufacturer, announced on July 30, 2010, that it has launched sales of its solar-powered LED lighting equipment for bus stops. Electricity generated by built-in solar panels during daytime is stored in nickel-metal hydride batteries and used to automatically power the LED lights at night. For eight hours after dusk, the lights operate at an energy efficient level of 2.5 percent of its capacity when no one is around, but when people approach the bus stop the sensor turns the lights up to full brightness. 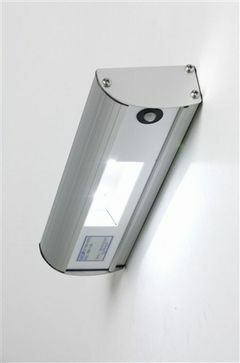 The equipment can be easily installed without connecting to any electrical power source. Furthermore, the use of high-brightness LEDs helps enable the product's long lifetime and eliminates the need for bulb replacement. There is a strong need for proper lighting at bus stops in order to increase convenience and security, but this has been difficult with conventional lighting systems because they require access to power and electrical wiring installation. Besides providing lighting at bus stops, Lecip is seeking to develop a broader market with an annual sales target of 5,000 units. Other potential uses include emergency lights for use during blackouts and times of disaster and safety night-lights for crime prevention.